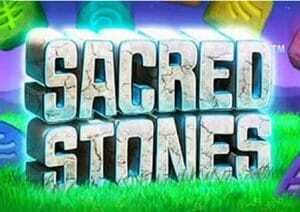 Giant Stonehenge-style monoliths are the setting for Sacred Stones. Created by Playtech, it’s a 5 reel, 20 payline game that comes with a Collapsing Reels engine that can deliver up to 50 free spins if you get on a roll. Stakes start at 20p, rising to £20 per spin. There’s nothing overly flashy about the design of Sacred Stones – a prehistoric monument by night forms the backdrop to the action here. On the reels, you’ll see 8 different stone symbols, each etched with a rune-style carving. The most rewarding symbol is the red stone – land 3, 4 or 5 of these on 1 of the game’s 20 paylines and you’ll receive a 2.5, 5 or 50 times bet payout. Helping to create those winning combinations is the W stone which is the wild – it can land on reels 2, 3 and 4 only. It spins in a stacked formation so it’s possible to fill a reel, or better still, multiple reels with stacked wilds. After every winning spin, the successful symbols are blasted away and new symbols drop in and replace them. If these create a winning combination, then the process is repeated. This is known as the Collapsing Reels feature. There’s a meter to the right of the reels which allows you to keep tabs on how many successive symbol drop wins you’ve managed. The symbol drops are in play during the Free Games feature as well as the base game so you can re-trigger even more free spins too – with no limits! Sacred Stones is a very straightforward game. The visuals are bright and clear and the thuds and clanging of the soundtrack is a nice fit. The gameplay is equally simple. The game is all about the Collapsing Reels – if you want plenty of variety from a video slot then this will be one to swerve. Expect plenty of repetitive action here. What you make of Sacred Stones will largely depend on your thoughts on symbol drop games. If you like the basic gameplay they offer then Sacred Stones should appeal. I also recommend you try NetEnt’s Gonzo’s Quest which also has multipliers with each successive win in the feature.